Simone and Zub pit Sonja against Conan! The Hyborian dream team comes together, in a tale of an “age undreamed of”, and fans of either of these two warriors should have a lot to be happy about. The first issue of the run introduces us to our two legends before they were legendary. The crossover starts with a heist as Conan and Sonja find themselves on a job to steal the same royal jewels. A truce is formed as guards close in on them, and they team up to make their escape. Don’t worry, the truce doesn’t last long, and we do get our inevitable fight. The action is well-laid out and the artwork does a great job. Also, it’s important to note that both of the stars of this little piece are given their due. (Minor spoiler) Both are given their time to shine, and neither comes out clearly on top. This time. 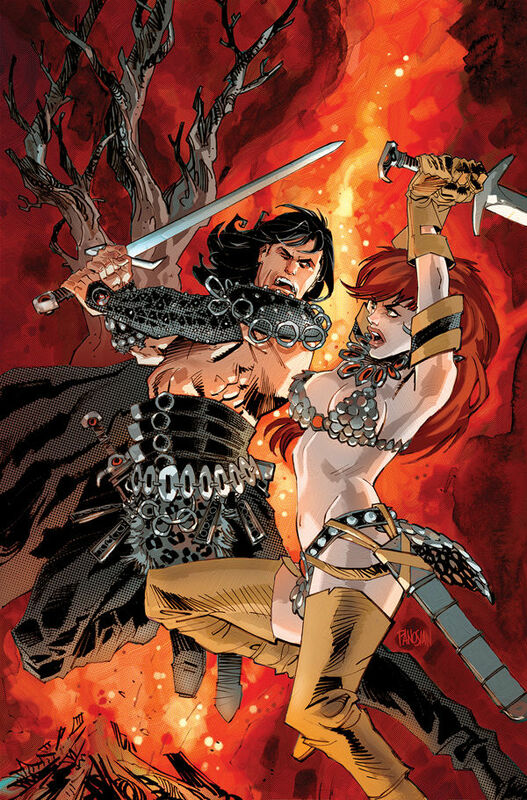 Since Conan and Sonja are both presented in their relative youth, both brash and boastful, there’s plenty of time for this relationship to percolate into something bigger and infinitely more violent. I’m looking forward to the promise of the story, taking place over the course of the lives of these two fantasy favorites.